Thursday 25. May 2017 - Zünd is delighted to record very favorable results from Fespa 2017 in Hamburg, Germany. Before an international audience, the leading manufacturer of digital cutting systems presented, for the first time, its laser module designed for cutting polyester textiles. 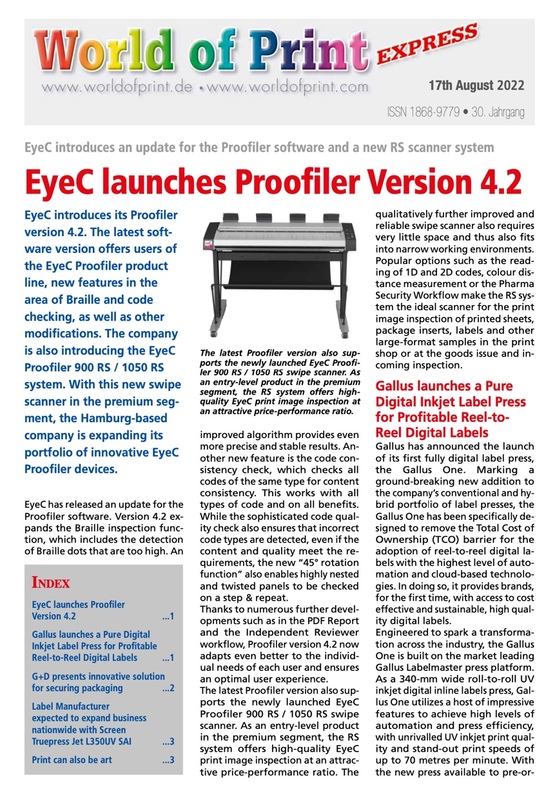 Zünds latest routing solution, the high-performance 3.6 kW RM-L, also delivered an outstanding performance - in the truest sense of the word: The RM-L routing module garnered the coveted EDP prize for Best digital cutting system. Fespa attendees showed a great deal of enthusiasm for the new laser module LM 100W, whose appearance in Hamburg was the first on European ground. The laser system cuts and simultaneously seals the edges of polyester fabrics. Essentially, the laser beam uses high heat to cut the fabric. This causes the material to melt and creates clean, perfectly sealed edges, which prevents fraying. The new Laser Module LM 100W is further evidence of Zünd’s resolve to offer users digital cutting systems that stand out in terms of versatility and modularity. In conjunction with Fespa 2017, the European Digital Press Association, EDP, honored the best technological developments of the year with its 2017 EDP awards. Once again, Zünd was awarded a prize – this time for the RM-L high-performance routing system, which received the coveted award for “Best digital cutting system”. Zünd’s latest and most robust router option delivers an impressive 3.6 kW of power and is designed to process acrylics, aluminum/ACM, Forex, and MDF with unprecedented speed and efficiency. The commanding force of this router, combined with up to 0.7 Nm of torque, opens up new possibilities for processing thick, hard, dense substrates. Made possible by the RM-L, greater processing speeds and cutting depths reduce the number of passes required to cut these materials. This, in turn, leads to significantly higher throughput and greater productivity. To explain its choice, EDP’s technical committee cited the fact that the RM-L router module allows a Zünd cutting system to be transformed in mere seconds to a high-performance router designed for heavy-duty routing applications: “The RM-L essentially eliminates the need for a separate router table”. “Fespa has once again proven its outstanding value as graphics industry tradeshow and has more than met our expectations. More than ever, our customers are focused on maximizing productivity. What Zünd can offer them, is high-performance, long-lasting finishing equipment – an absolute must for flexible order fulfillment,” says Lars Bendixen, Product Manager Graphics.